Oh, Laura Wiess, why do you have to keep making me either cry or at least tear up from your books? Although perhaps I wouldn't say that Ordinary Beauty was so much on the masterpiece level as How It Ends, still this book was powerful past words on pages. And I think I can also say that its heroine, Sayre, was my favorite out of all four Laura Wiess books. Hanna from How It Ends occasionally annoyed me, in fact: because of the dynamics of that story, it wasn't necessary to believe in her and care for her as much as it was for Sayre. From early on, Sayre wins you over with what almost appears as bleak optimism as she trudges through snow and pain to not continue the cycle of hurt that made up her childhood. As the book develops, there are quick and vague explanations of Sayre's past that eventually ease into full narration of her history and the people she has known. It's a perfect connection between past and present, between what Sayre admits about her life in the beginning and what she reveals in the end. Naturally, it's another heartbreaking book. But the emergence that occurs in it is also very encouraging and very applicable: "ordinary beauty" is about seeing the wonderfulness of a simple, full day. It's about love and appreciation and about first seeing and then basking in the ordinary beauty: that is what ends the cycles of violence, hopelessness, flatness, and pain. 1) Fossil Piece - This piece I bought (at the Discount Gems & Minerals place in Sedona) actually wasn't the one I had in mind: that one was long gone. 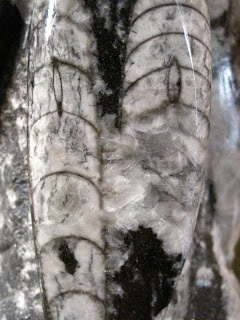 However, it is of the same variety (and rather difficult to photograph, hence the extreme close-up that reveals nothing of the actual shape of the piece). It helps satisfy my reaching for anything that reminds me of Primeval, just as I once reached out for all sorts of Medieval things because they reminded me of Middle-Earth. 2) Hair Milk - I tried a bit of this a couple of years ago, but had forgotten how great it is. It's formulated with more natural type of ingredients, and just a small amount added to wet hair brings out the small amount of curl my hair has and keeps it from turning too frizzy or bulky. I sidestep most hair products, but this one is worth using. 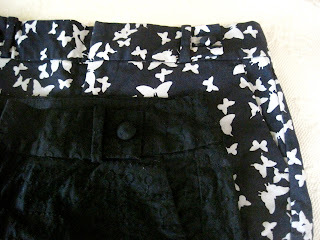 3) Banana Republic Shorts - I happened to come across an amazing sale at Banana Republic (okay, it was actually one of their outlet stores), so I picked up two pairs of shorts (probably I could/should have gotten a third). One is dark blue with a butterfly pattern, the other black with lace-like embroidery. Very happy purchases. 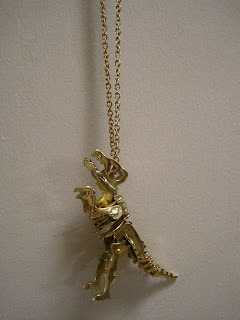 4) Tyrannosaurus Necklace - You may have caught sight of this necklace already in the latest of Connor & Abby's adventures. I discovered it on ModCloth (which is a rather cool site I also recently discovered), and of course I bought it because of Primeval. It's about three inches in size and has quite the detail in it. It may be bold (it's brass, so I'm looking forward to it tarnishing and getting less shiny), but isn't a dinosaur necklace cooler than a standard owl one? 5) Burt's Bees Lip Shimmer - Though the tinted lip balms are newer than the shimmers, I had actually never tried the shimmers. They have a bit more color and a tad of shine (but not too much), and also a bit of peppermint flavor that puts in mine Tarte's lip colors. I tried out the new color, Strawberry, which gives a happy and light pink. A great staple to have. 6) Goat Milk Soap - This soap came from a booth at a craft market, but you can also buy it online (though I would recommend buying a similar soap from a local source instead). I was most intrigued by the variety, Horchata, which means that the soap smells wonderfully of cinnamon. Though it's a little on the gooey-side, I otherwise love this soap--it makes for a nice face scrub, too. 7) Laura Wiess - There are few living authors I follow closely (as in, read all their new works), but this month I have officially added Laura Wiess to the list. She's quite the capable writer. 8) Zoya Nail Lacquer - I do like green, but I don't tend to wear very bright colors, so most green nail polish shades aren't quite right for me. But then I found this earthy shade by Zoya that hits just the right level. It also brushes on smoothly, making me willing to try more from Zoya in the future (I found the brand at Ulta). 9) Tarte Cheek Stain - Someone actually gave this one to me because she didn't like it much (I think because it wasn't long-lasting enough), but I have come to like it. This is my first cheek stain, and I of course love that it's by Tarte. The form is like a giant chap stick, so you can rub or dab it straight on or apply it with your fingers. I usually dab it so as to get a very subtle amount on (otherwise you can really bring out the red, which really isn't my makeup style). Applied this way, it gives a natural look, and I haven't noticed yet that it fades quickly. 10) Alpaca Wool Hat - I was certain I had already mentioned this hat, but apparently not. I found it at another cool site called Local Harvest (click on Shop, then Farm Crafts to get to the Clothing section). Usually I've been getting the vintage hats, but I thought I could make an exception for a friendly alpaca wool hat--it's supporting happy alpacas, right? Oh, and I've been trying to practice one of Hatter's hat tricks from Alice, but it's very difficult. Two days ago, sisters Hilly and Hannah Hindi of the Internet parody duo The Hillywood Show, of which I am very much a fan, released a new kind of video. Under the artist name "Hilly + Hannah," they released a music video to an original song, "Saturday Night," that is also available on iTunes; you can view the video by clicking here. They revealed plans for this song months ago, and even then I wasn't sure what to think about it. Parodies and original songs? But they're certainly not the first YouTubers to release music on iTunes, and it's usually a good thing to try out new things--even if they don't turn out perfect, you can learn about what worked and what you did/didn't like about them. So while the song didn't turn out to be my favorite (I suspected it wouldn't be: Hilly and Hannah like hip hop--I don't really), I can respect and maybe even admire the experimentation and branching out. But my disinterest in this new venture goes deeper than that, into the lyrics of the song and the form of the music video. You see, my love of The Hillywood Show (back when "Twilight Parody" was their only parody apart from the original episodes) grew, in many ways, from watching the behind the scenes videos and seeing how much fun Hilly and Hannah had putting the material together and how positive they seemed as people. That matters for my YouTube subscriptions: I like positive inspiration, if you will, even in my entertainment. But this music video, while sleekly put together and all, just looks like a music video to me. It doesn't remind me of The Hillywood Show; I know that it isn't exactly a Hillywood production, but still . . . where is the connection to the minds behind the show and the video/song? And then there are the lyrics: they sound like standard hip hop lyrics to me, about dancing and dating/flirting. Is a "just dance" message it? I don't think I have anything against plain entertainment, but something of the wholesomeness, if you will, of Hillywood felt missing from this music video. So while it was interesting to see something different, it's still going to be the parodies/behind the scenes that I look forward most to seeing. If you haven't seen it yet, you can view Peter Jackson's new production video here. And, yes, it has spoilers. There were three main things that caught my attention in this video: Radagast, Andy Serkis, and Beorn's Hall. I remember hearing something or other about how Radagast would be in the movie, but probably tried to store away the info outside of memory (wanting to not know everything about the movie beforehand). But the brief moments in the vlog showed an actor approaching his character in as tactile a way as does Ian McKellen and a home that is as decorated a set as Bag End. Looking forward to seeing more. And it looks like Andy Serkis has been having a good time as the second unit director; if any of the actors had this role, it seems only fitting that he be the one. I loved the shirts some of the crew were wearing, emblazoned with the words "Andy's Flying Serkis." I literally gasped when they showed Beorn's Hall, of which I hadn't previously seen anything (I can't say for sure if anyone else had--I've been staying away from most of the production/character photos). Maybe it's just because I've spent so much time on Beowulf in a few of my classes, but it was amazing to see this Hall. What is a relatively simple space became awesome--and that bodes well for the scenes with Beorn. Some books are like miniature drills, starting by putting little scratches in your skin and then moving on to inflict deep sores that throb and ooze tears hidden tears. It's a flowing process, a painful one, and one you will literally have to emerge from when you close that last page. Before How It Ends, Laura Wiess brought us Leftovers and Such a Pretty Girl. (Her latest book, Ordinary Beauty, also came out last year, but I'm not sure I'll get to it before the summer is over.) In all three of these, there is uniqueness, starkness, and such emotion. How It Ends is the longest at around 350 pages and covers such ground that you won't want to speed through it too quickly. It starts fairly simply, switching between the perspectives of teenage Hanna and her aging neighbor Helen. There are some parallels and contrasts between them, some touching moments, some harsher moments. But somewhere around the halfway point, something changes. Layers come in, endless depths strive into view, and any and all emotions plunge into your mind through the written words. Because nothing is glossed over (sensitive readers be aware), a complete life picture can be created. You can choose many focuses through which to look at this book: feminism, youth and aging, death, sickness, romantic love, familial love, friendship, generation gaps, connections between generations, nature, medicine, school, parenthood, hidden histories, human rights, animal rights. It's fairly dense, but also so easy to read. The language in this book is perfect. The characters' voices are their voices. Some parts read almost like a journal, some more like one person speaking to another, and each style is appropriate and fitting for each section's content. This book is stunning. Laura Wiess is an artist. Nick Willing is a smart guy. I have come to that conclusion. First I watched Tin Man, enjoyed it more than I expected. Then came Alice, which I liked and may or may not have ended up buying, as well. Now we have Neverland. The three of these were made-for-TV miniseries, based, respectively and loosely, on The Wizard of Oz, Alice in Wonderland, and Peter Pan. A recipe for disaster, right? Well, not really, not if the acting passes the test and the minds behind it all know what they're doing. And Nick Willing knows what he's doing. If you listen to the commentary on Alice, you can hear him talk about all the tiny details and all the ways he incorporated inspiration from the original story while still taking things in a different direction but somehow still doing something very similar. It's a delicate balance, and one you will have no chance of achieving if you don't understand exactly how the original story works. I expect most people who wanted to see it have watched Brave now, but if you haven't and do not want to hear spoilers, stop reading. Most of the reviews I glanced at before watching said that it was a good movie, but not a great one--that it would have been a very good effort from another studio, but wasn't as much as they had expected from Pixar. But unlike, it seems, most people, I never developed that awe of Pixar. Toy Story is good, of course, and I can't say Up wasn't, too. But Pixar as an entity hasn't amazed me with perfection. And that's exactly what I thought of Brave. The first portion of the movie was more or less "usual." I thought it was finally getting better when Merida met with the witch for the first time . . . but most of what followed that scene didn't reach very high levels. And I never felt that Merida went through much of a transformation in the movie: she just makes a mistake, has a tiff with her mother, and then decides to do better. It's all very little. Okay, it's nice to see Brave taking the unwanted marriage plot and giving it a new turn, turning it into a mother/daughter relationship story. But it could have been better. The whole bear thing, for instance, could have been more symbolic. You have the mother bear idea and the bear as a figure of power and a sort of kingliness (both Beowulf and King Arthur's names possibly contain the word "bear" in them). But instead two characters just randomly turned into bears: why? Because the witch has a one-potion-solves-all fix that turns everyone into bears, no matter what specific wish they ask her for? Who is this witch, anyway? How did Mordu meet her? What is her connection to the will-o'-the-wisps? And why was Merida's archery emphasized so much in the beginning only to fade away? I suppose the movie is supposed to show the truth behind mythologies, how they were formed and how we can use them. But it felt very shallow to me. It felt more like a TV movie than one to see in theatres or give too much attention. It needed more depth, and I think a fairly small amount of tweaking could have given it that. Without that, though, it's fading fast from my memory. There have been a good amount of dinosaur-related items around me lately, which has been confusing Abby and Connor. First, I had to assure them that this triceratops was, in truth, only a cookie. It took a moment for them to believe me. 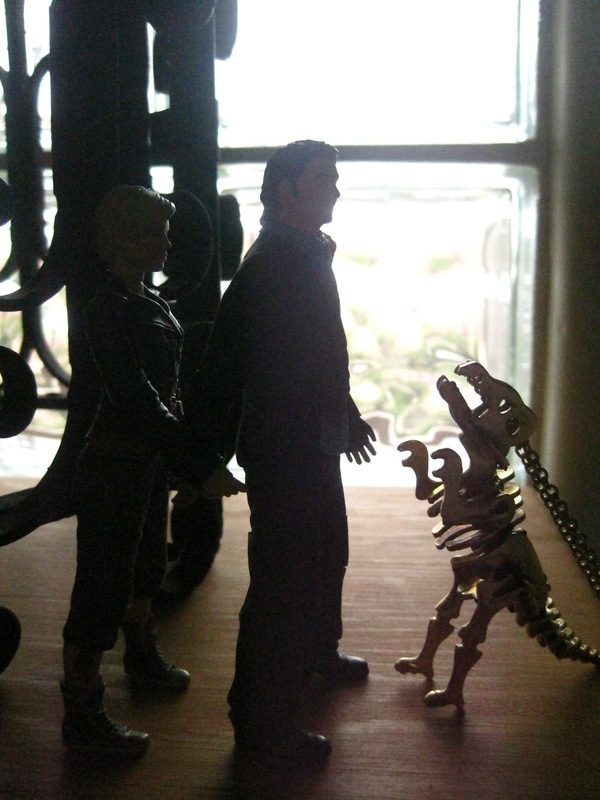 Then they caught sight of what seemed a miniature Tyrannosaurus; Connor tried to shield Abby from its sharp teeth. But once again, it was only my new necklace. Once I had informed them of this, the two started in on an examination of it. Abby was concerned that real dinosaurs had been harmed in the making of it, and Connor wanted to make sure it wouldn't "come back to life." Since I enjoyed Gayle Forman's If I Stay and its sequel Where She Went so much, it was time I read one of her earlier works, as well. Sisters in Sanity is from 2007, and while I wouldn't say it is as wonderful a book as those, still it shows the development of things I enjoyed in their pages. The basic plot is about a girl who has lost her mother and whose dad/stepmother send her to a boarding school for troubled teens that turns out to have the opposite of helpful counseling/fair living conditions; she makes friends with a couple of other girls at the school, and they help each other out and keep their spirits up by knowing that they all care. While some of the school's conditions made me indignant at the staff, somehow it became an enjoyable novel to read. There is a lightness of spirit and also a strength of character in it. It isn't so much about uncovering a harsh school (the school featured is fictional, though the author's note does point out, along with this fact, that there are schools out there not giving the proper conditions to actually help people), but about gaps and overcoming them. There are the obvious generational gaps, the gaps between categories (similar to cliques), gaps between people in the know and people who are ignorant, gaps between those who have found healing and those who are on the way and those still in denial. This book is about overcoming whatever it is that comes to trouble you by relying on yourself, but also by confiding in love and companionship. It's a short read--I read it over two days. Honestly, I didn't want to spend more time on it, though it is a nice piece of work. Recommended for fans of Gayle Forman's other works and readers who enjoy a good teen story. Often I say that I have the same taste in books, music, and movies, probably with art included, too. I feel like I am always responding to the same types of things, whether in the form of a Flyleaf song or a Charlotte Bronte novel. Things may appear very different, but they may have different coloring when viewed by my eyes. And so this brings me to the origins of art and also to its purpose. I have come very much to dislike Oscar Wilde's statement in the Preface to The Picture of Dorian Gray that "all art is meaningless" and its only value is in its beauty and aestheticism or some such thing. I disagree: art has meaning to the creator because its creation is a process (one that often comes with healing or other such products), and art also illuminates anything from an individual's experience to a society's particular (or not so particular) traits. All societies have art, in one form or another. And even tasks like planting seeds and building a basic chair have art to them. So when it comes to art like the first four forms I mentioned (the usual books, music, movies, and paintings/sculptures/etc. ), how do I like art to arise? Should it come free of itself? Should it come with intention and plans? Should it have a specific purpose or message? Should it be a question? I think it can be any of these things, or any combination of them. Some art is very purposeful, like a documentary probably is. The director sets out with the intention to enlighten the world about a particular subject, but probably also learns some new things himself along the way (and some would argue that the thing the director learned is what made his documentary art). Or you could reference Tolkien, who set out in The Lord of the Rings to create a British mythology; but even he, he who liked to be in absolute control, built off of things like languages that had been forming in his mind for years. That's why I think "expression" is the perfect way to describe art. An author may not know what his story means while he is writing it, but it's flowing out of his mind so that he must let it take physical form, just as human beings have always found a way to communicate no matter in what language. Somethings expression is to a certain aim and sometimes it isn't; most often, I think it is both.